My eleventh-grade students are about to begin reading Aristophanes’ Frogs (having finished Book IV of Aristotle’s Politics). In honor of the occasion, I thought I would get some frog masks. I went to the huge costume store near Union Square with low hopes, since I have been disappointed there before. I was disappointed again. Real costume stores are rare. In their place, you find stores with costumes taken directly from TV shows and movies. Instead of dressing up like a frog, children have only the option of dressing up as the Disney version of Kermit (not even the Sesame Street version). Instead of being a princess, they must be Princess Leia. Instead of dressing as a monster, they must be a specific one from Monsters University. There are hardly any robes, eyeballs, robes that stand alone. It is not a problem to have costumes for fictional, dramatic, mythological characters; what bothers me is that they’re already defined by a TV show or film. Kids know exactly how they’re supposed to look as these characters; there’s little room for invention or eccentricity. It would be one thing if a store had a few such costumes; now, nearly all of the costumes are based on characters from big-budget movies. In short, the store had no frog masks. It did have a rubber Kermit mask (in the Disney section, of course). Determined to have something to bring in, I got it. “All sales are final,” said the person at the register. I regretted my purchase right then but went ahead with it. I went home in a somewhat gloomy mood, thinking about the demise of costume stores and all that comes with them. As I walked from the train station to my place, I saw a big 99-cent store. “Oh well,” I thought. “I might as well stop in there. For all I know, they have frog masks.” I even thought of making frog masks from construction paper–but am not too good at that kind of thing, and know they would fall apart right away. 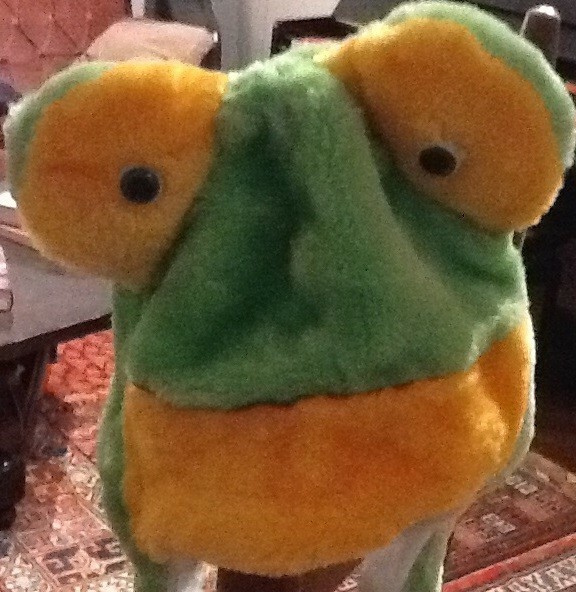 The store didn’t have frog masks, exactly, but it had seven adorable frog caps (with no relation to Disney). I snatched them all up. We will have frogs today. This is not a satire. I am in the St. Louis airport, about to head home after giving a talk and taking part in a lively panel discussion at the Annual Meeting of the National Association of Schools of Art and Design. It was a great occasion for a number of reasons–but this post is not about that. When I stood in the security line at the airport just a few minutes ago, a Transportation Security Administration officer told the man in front of me that he was approved for “pre-check” and could go through a special line where he didn’t have to remove his shoes, take out his liquids, etc. The man asked why he had been approved for pre-check. He had never heard of such a thing. The TSA officer didn’t have an answer for him. In a little-noticed proposal, the Department of Homeland Security says that it plans to upgrade to its new Secure Flight System, which pre-screens all passengers. … TSA says that the new Secure Flight would be used to send non-members who are tagged as low-risk passengers through the Pre-Check lines, even if they aren’t members. According to Government Security News, the TSA has awarded IBM a “bridge contract” for this program. Is the program already being deployed, then? Will the “low-risk” passengers be separated by privilege from the “we-don’t-have-enough-data-on-them-yet” passengers?